2x World Longboard Champ Jen Smith will be on hand alongside our awesome Surf With Amigas instructors to demonstrate beautiful long boarding during two retreats in January. She’ll be available to help Amigas improve their longboard skills whether that be learning to walk the board, hanging five for the first time, executing drop-knee turns, or simply working on style. The resort is nestled at the bottom of an 800 acre private biological reserve and looks directly out at the ocean. The lodging is eco-friendly and rustic but comfortable, with large screened windows, fans to keep cool, and ensuite bathrooms. Each room is equipped with 3 or 4 beds and will sleep 2-4 Amigas. There’s a covered restaurant area for meals and where we’ll also do our video coaching and “classroom” sessions. The yoga space is a beautiful wood floor studio surrounded by jungle. 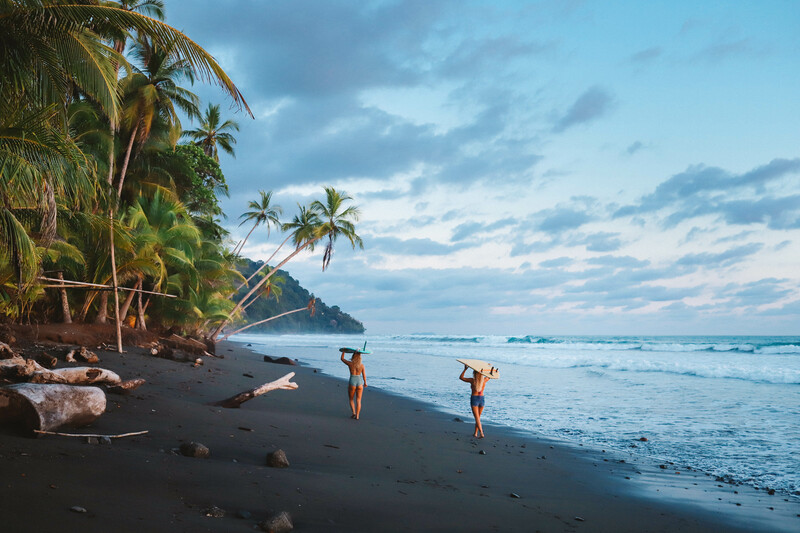 This region in Costa Rica is also regarded as one of the most biologically diverse places in the world. Expect to see monkeys, sloths, toucans, scarlet macaws and a variety of other local creatures! Since we will be staying near the end of a dirt road, essentially in the jungle, we’ll enjoy the chance to disconnect from the “real” world. There is limited cell service and no wifi at the resort. However there are several internet cafes in the area, two a short bike ride away. There are bikes provided for guest use. Our instructors also like to check in once in a while, so there will undoubtedly be some “internet missions” happening. There will be cell service at some of the spots we’ll surf as well as where we’ll go for our ladies night out dinner, so if you activate international data roaming on your phone you will have an opportunity to check in that way. Family members are always welcome to call the resort number as well in order to check in (that number available in the travel info document). There are several waves within walking distance. There are a couple faster waves out front, and a few slower waves a little ways down the beach. If the swell is bigger we’ll be on a mission by boat or car to surf some of the longest waves in the world. There are a couple of world class waves where you could get the wave of your life (pray for swell! ), and a few other nooks and crannies that are also super fun and lesser known. We’ll be on surf safari to get you into the very best waves for you, breaking up the group by ability and board size so that everyone gets what they’re looking for, and we don’t show up anywhere with a big group! For more on Jen Smith, enjoy the following video.